Get a better sense of visitor satisfaction by allowing them to provide their feedback about their chat experience. Visitors can rate a chat as either Good or Bad during or after the chat session. Once you enable chat rating, all your visitors can see the prompt to rate chats. There is no way to customize the rating icons or messages that visitors see. Agents can see ratings and comments in real time during the chat, or you can view them afterwards in History. You can't currently report on chat ratings in Analytics. We're working on providing reporting support soon. Until then, you can export chat ratings as a CSV file from History (see Enabling and viewing chat rating below). Visitors can click the thumbs up or thumbs down icon at any point during the chat. When they click a rating, a window appears prompting them to leave a comment. They can also change or remove a rating and leave a new comment. While all ratings and comments will appear on the chat's transcript, only the last rating and comment the visitor leaves will be counted as the overall and final rating for the chat. When a visitor rates a chat during the session, they're prompted to leave a comment with the Leave a comment button. When either the agent or the visitor leaves the chat, visitors who haven't left a rating yet, or who have left a rating but not a comment, are prompted to do so. 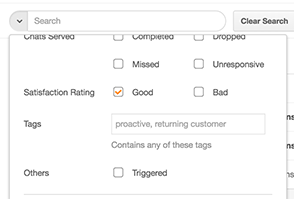 Agents can also choose to prompt visitors to leave a rating during the conversation by clicking Rating in the bottom right of the chat window. The visitor sees a Rate this chat link in the widget. 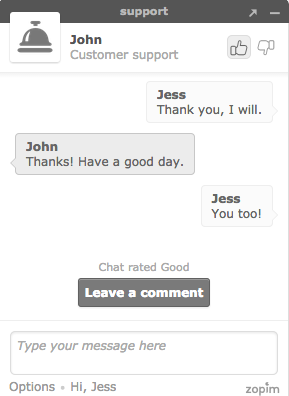 Agents and visitors can view ratings left during a conversation in the chat window or in the chat transcript. Once you enable chat rating, it's enabled for all your visitors. There's no way to customize the text or icons that appear. You can view and search for past chat ratings in History. From the dashboard, go to Settings > Widget. Under Satisfaction Ratings, select the Enable Satisfaction Rating box. The ratings also appear in the transcript under History. The chat rating icon appears in the list of chats and in chat transcripts. Use advanced search options to search for chats by rating. Select chats and click Actions > Export chat details to export the results as a CSV file. 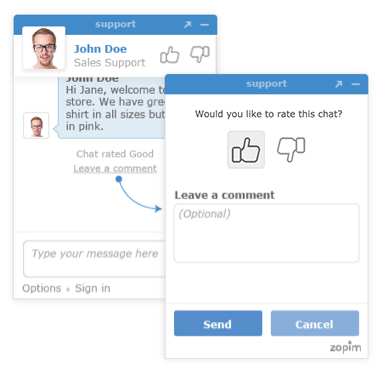 If you've enabled customer satisfaction ratings in Zendesk Support, Support tickets created from chats with ratings will have the ticket rating updated by the most recent chat rating when the ticket is created. For example, if a chat is rated Good and a ticket is created from that chat, the ticket will have also a positive satisfaction rating. For more information, see Using customer satisfaction ratings. Hi, is it possible to modify the customer satisfaction part in the chat? A lot of our users do not see that they can click thumb up or down and only leave a comment. Hi, is it possible to select more than 1 page of chats at a time for export/reporting purposes? Thanks!